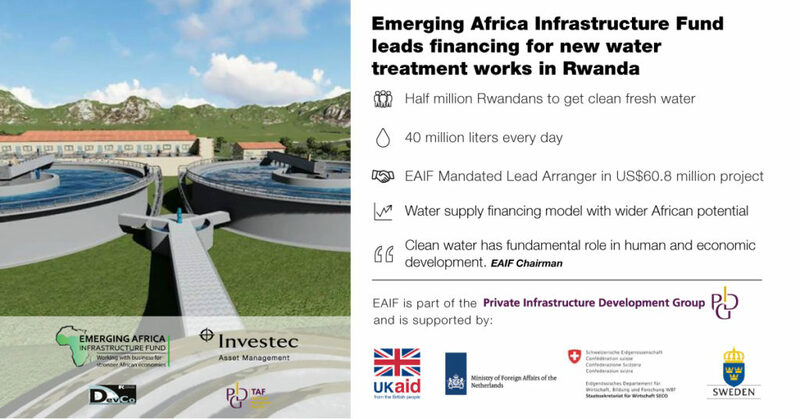 The Emerging Africa Infrastructure Fund (EAIF) announced today (27 November) the signing of the financing for a large-scale water treatment facility in Rwanda. It is the first Bulk Surface Water Supply in sub-Saharan Africa using a public/private partnership (PPP) model. It is also one of the few sub-Saharan Africa water infrastructure projects being done on a Build, Operate and Transfer (BOT) basis. It is EAIF’s first water project in a big city. A member of the Private Infrastructure Development Group (PIDG), EAIF is mainly funded by the governments of the UK, The Netherlands, Sweden and Switzerland, as well as private sector banks and FMO, the Dutch development bank and its German equivalent, KFW. EAIF, the Mandated Lead Arranger of the financing, is lending Kigali Water Limited (KWL) a fully owned subsidiary of Metito, one of the world’s largest water infrastructure and utility providers, US$19 million of Senior Debt and US$2.6 million of Junior Debt. The African Development Bank is providing another US$19 million of Senior Debt. All of the loans are for 18 year terms. The lenders are covering US$40.6 million of the capital cost of the US$60.8 million project. The balance will be provided as equity finance by Metito. The project also benefits from a US$6.25 million grant from PIDG’s Technical Assistance Facility. The grant was a significant element in the creation of the financial package. 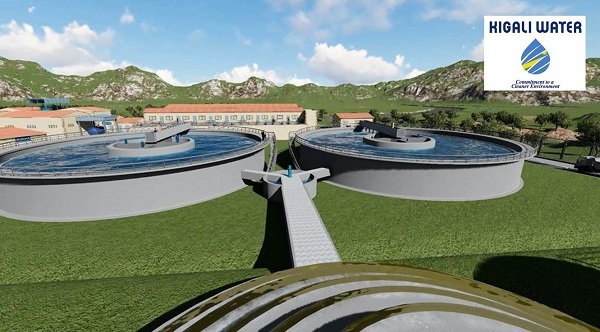 Another PIDG facility, DevCo, which is managed by the International Finance Corporation (IFC), provided initial financial support to the Government of Rwanda for the legal, financial, technical and environmental feasibility assessments of the project. The IFC advised Rwanda’s government on this work. It ensured an optimal solution for the long-term needs of Kigali and recommendations for a public/private partnership structure that best suited the development objectives of the Rwandan government. The announcement of the project financing is being hailed as a landmark moment in Rwanda’s social and economic development. The country aims to see 100% of its 12.4 million people having reliable access to clean water within the next few years. Currently, some 86% of urban areas and 72% of rural areas have access to improved sources of drinking water. “The conclusion of the financing is tremendous news for Rwanda,” says EAIF Chairman, David White. The site for the new facility is at Kanzenze, south of Kigali. Water will be drawn from the Nyaborongo River to be treated before distribution to domestic, commercial and industrial customers. The plant will have the capacity to supply up to 500,000 people in Rwanda’s capital, Kigali, providing 40 million liters of fresh, clean water a day. When complete, the facility will provide around one third of Kigali’s water. In addition to the public health and economic development benefits of the project for Kigali’s one million population, it will also mean a significant reduction in water rationing in the city. KWL is owned by Metito, which has 60 years of experience developing and managing water facilities in international markets. To date, Metito has built over 3000 water treatment facilities some of which are in the most arid areas and challenging environments around the world. KWL will design, build, maintain and operate the treatment plant and sell potable water to the Water & Sanitation Corporation of Rwanda (WASAC) under a 27-year public/private partnership agreement. It is estimated that fifty new full-time jobs will be created to manage and maintain the plant. Construction is forecast to take thirty months from the commencement date and employ 100 people. Rwanda has made great progress in recent years in implementing policies to alleviate poverty and modernise the nation’s economy and infrastructure. Its aim is to be a middle- income country by 2020. According to the World Bank, between 2001 and 2015 Rwanda averaged real GDP growth of around 8% and achieved rapid poverty reduction. By 2018 it aims to have raised GDP per capita to US$1000 per annum, have less than 30% of the population below the poverty line and fewer that 9% of the population in real poverty. EAIF is managed by Investec Asset Management, one of the largest third-party investors in private equity, credit, public equity and sovereign debt across the African continent.